It’s important to prevent the water system on your vacuum excavator from freezing. The Vactor HXX water tank is manufactured from HDPE which retains heat in the cold winter months better than steel or stainless steel materials. Check coolant and use recommended antifreeze/water mixture for the lowest temperature expected during operation. Make sure the water heater works properly. Use hydraulic oil and lubricants designed for the cold weather. Maintain the battery by removing and cleaning cables, cleaning cable ends and posts, and cleaning and tightening the terminals. The service technicians at your equipment dealer can also provide helpful advice. 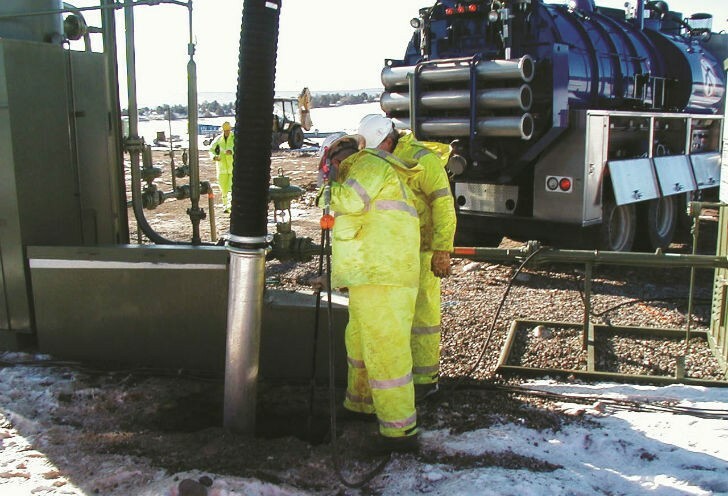 Beyond the basic winter maintenance tips, Vactor Manufacturing offers some additional recommendations to keep your vacuum excavation equipment operating efficiently throughout the winter. For vacuum excavators, digging in extremely cold temperatures or air excavation can provide the most stress on the equipment. Not all equipment is designed to operate in cold temperatures. Vactor vacuum excavation trucks are designed to operate efficiently in temperatures as low as minus 40-degrees F (minus 25.5-degrees C). Vactor offers a number of cold weather options, including heated storage, heated water pump and water heater cabinets, toolbox heaters, and warming cabinets. Vactor vacuum excavators featuring the Kenworth T880 chassis can be equipped with an arctic package including a block and pan heater, heated fuel water separator, coolant tank heater, battery pad heater and arctic hose options for colder extremes. It’s important to prevent the water system on your vacuum excavator from freezing. The Vactor HXX water tank is manufactured from HDPE which retains heat in the cold winter months better than steel or stainless steel materials traditionally used in other equipment. The tank water can also be preheated through the onboard water heater that is capable of 800,000 BTUs. For extreme applications, the Vactor HXX is also available with a heated debris body to prevent excavated material from freezing up and greatly improving material offloading in the cold winter months. Make sure all water lines are heated and insulated – including the water pump cabinet. Allow hydraulic fluid and transmission fluid to warm up before operation. Before heading out on the job, check airline hoses for cracking, and make sure the air dryer is functioning properly to prevent lines from freezing (alcohol can be added to the system to prevent freezing). Make sure all lights are operating and free of snow, ice and dirt. Use a recirculator to circulate water through the water system during transport. Check the recirculator each day to ensure that it is operational. If the telescoping boom is frozen and can’t be properly extended, retracted or cradled, insert a digging lance into the end of the boom and run low-pressure heated water to thaw any ice. Keep tires inflated to the proper pressure rating. Tire pressure decreases over time, especially when winter temperatures fluctuate. Regular washing of the truck, especially during the winter, will help prevent the buildup of salt and other corrosive material that can cause rust or wear. When shutting down for the day, drain and purge all water – or run glycol through the line with a glycol injection system to keep water from freezing – especially if the vacuum excavator is parked outside in the cold at night. Vactor vacuum excavators feature an air purge option that uses chassis air to blow out the water line at the end of the day. For the safety of the operator – and any others on the jobsite, or on the road when traveling to and from the job – good visibility is essential. Keep the windshield wiper fluid tank full with a winter blend to prevent freezing, and install winter weather wiper blades to help keep snow and ice off the windshield. Proper lighting is also important for enhanced visibility, especially during the winter months when the days are shorter and sunlight is minimal. When driving in snow, vacuum excavators and other vehicles can be hard to see, so it’s important to include additional lighting on the truck beyond the standard clearance lighting to increase visibility. Additional work lights should be installed on vacuum excavators to enhance visibility to the site when working in the early morning or evening hours and when working in snowy conditions. For added visibility and safety, operators should also wear reflective gear over their clothing. Depending on the job, a vacuum excavator operator might be working in very remote locations, far from the closest town. They might be facing steadily dropping temperatures, with snow and ice in the forecast. With this scenario in mind, Vactor recommends keeping an emergency survival kit in the truck that includes extra hats, gloves, gaiters and other winter clothing; blankets; food and water; flashlights; batteries; matches; emergency flares and first-aid kit. Vacuum excavation equipment requires thorough maintenance to keep it running smoothly year-round, and especially during the winter months. Ben Schmitt is product manager with Vactor Manufacturing.